With her horse, Scamper, Charmayne set an unprecedented record by winning the World Championship Barrel Racing title ten consecutive years. She was also the first barrel racer in rodeo history to win more money than any PRCA cowboy during a single rodeo season. 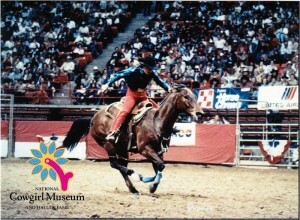 Charmayne began barrel racing in New Mexico as a young girl, entering the pro rodeo circuit at fourteen. Charmayne trains her own horses for barrel racing, cutting and team roping competitions.